Real green grass, low maintenance lawn specialists. You CAN grow a real green grass lawn in Spain if you choose the right type of grass!! We sell grass (seed, turf, plugs and easy lay) and a wide range of lawn products for a complete solution for your new or renovated lawn. Garden Lawn Power Products including composts, tested Selective Lawn Weed killers (Herbicides), Feed and Weed Products, Fungicides, Pesticides, Lawn Fertilizers, and Cool Season and Warm Season Grass Seed. For help with the ordering and delivery process see our Help Page. Welcome to our On-Line ordering system to help our customers place orders when we are not open. If you prefer (if you are concerned about security) you can always send your order to us via your email system. For YOUR added security, we never ask for, or hold on record, any of your card or bank details. Just place your order and we give you OUR details so you can choose to pay securely through your Bank by IBAN or on-line using your on-line banking app on your computer or mobile phone. Product marked with this symbol are dangerous and should only be used by professionals. In any event, as with hazardous substances, normal handling, contact with skin, washing after use etc precautions should always be taken. Note: Min order value, excluding books (or unless purchased direct from a Distributor) 100 euros. Orders less than 100 euros will incur a supplement charge. There may also be a transport charge. Please see our Standard Terms and Conditions. 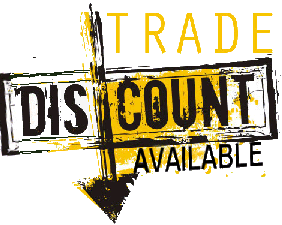 All our garden products are easy to use and are effective, tested and only available through our office in Benissa - please contact us directly. A Planting and Aftercare Guide is supplied with every order. Ready to go organic compost for lawns. Ideal top soil or for top dressing. Peat based dark, rich, organic, garden soil additive compost. Great for adding to garden soil to improve its composition. Lawn Clear Type "C" (1 Litre) Tested selective broad leaf weed killer, recommended for use on Med Fine. NOT suitable for Lush or Green or broad leaved grasses. Example: 120 cc concentrate to 12 litres of water. Apply at concentrations of 1%. Apply enough to wet the leaves. Safe on Lush or Green or broad leaved grasses. Example: 120 cc concentrate to 12 litres of water. Spray application. Apply at concentrations of 1%. Apply enough to wet the leaves. When diluted covers approx 150M2 depending on weed density. Kills anything green (grass and weeds). Ideal for clearing areas of ground prior to planting a lawn. Also used on paths, driveways and patios. Concentrated - dilute to 1 - 2%. If neccessary (for stubborn weeds) re-apply 14 days after. Herb' Ready to Go 1 Type "C"
Kills seeds underground, as they begin to germinate. Tested lawn weed killer. Effective for the control of Crabgrass, Meadow grass, Wood Sorrel (Oxalis) and many annual weed grasses. 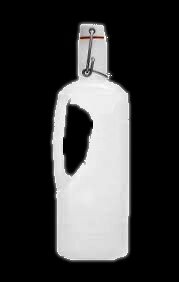 Concentrated - dilute to 1% and water in. Apply twice yearly. Contains lawn fertiliser and pH reducer all in one. Sprinkle on - water in. All purpose lawn repairer. Suitable for most types of Cool and Warm season grasses. Just sprinkle on and water in. NOT suitable for Economy, Green or Lush Grass. One application will last approximately 12 weeks depending on weather conditions. Only suitable for established lawns. Selective Lawn Weed killer, Kills oxalis, clover (and other weeds) in lawns throughout the Autumn, Winter and Spring. Concentrate sold in 1 litre containers. 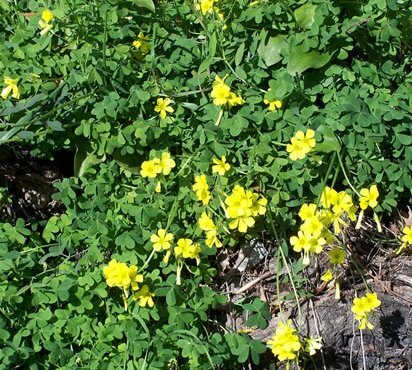 Oxalis is also known as "creeping woodsorrell"
Pre mixed in "Spray and Go" for spot treatment of problem areas in lawns. This product is safe on "Lush" and "Green"
Kills unwanted coarse grasses in fine lawns. Recommended for use on Bermuda type lawns to kill Kikuyu or Gramma Basta (Coarse grass). NOT suitable for "Med Lush" or "Med Green" lawns. * Spray application. Apply at concentrations of 2%. Apply enough to wet the leaves. Never apply an insecticide unless a damaging level of a known insect is confirmed. Insecticides are only effective if applied at the right time and in the right manner. Many insecticides also kill good bugs, use them only as a last resort. Our guidelines for this bug killer: Apply at 1 Kilo per 100M2 of lawn and water in. Tried, tested and effective. Kills grubs and adults of the red and black weevil in just two treatments. We can also supply this as a treatment service per palm tree. Please ring for quote. Kills many types of fungus infections like Mildew and Brown spot. Concentrate sold in 1 litre containers. Dilute to 0.1 to 0.15% and spray on. Granular lawn fertilizer for use on Lawns in Winter and new lawns. Apply our fertiliser during the coolest part of the day and water in. Suitable for all our grasses. 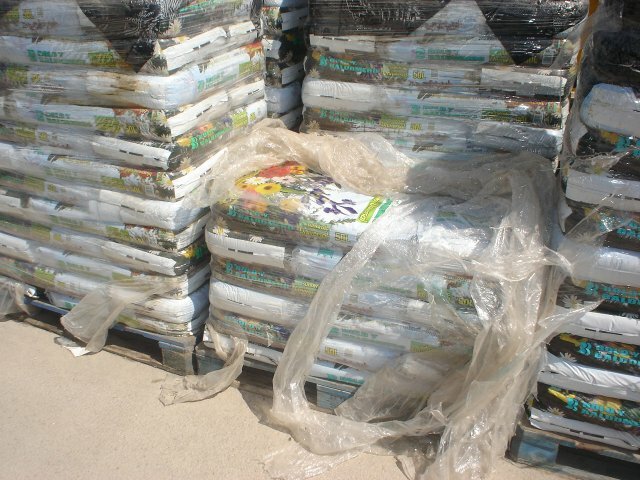 Our guidelines for this fertiliser: Apply at 1 - 2 Kilos per 100M2 of lawn and water in. Strong and specially formulated for the needs of Mediterranean Grasses. Improved green up and recovery of sick lawns. Use to promote leaf growth and improved colour. Strong and specially formulated for the needs of Mediterranean Grasses. Rapid green up and recovery of sick lawns. Use to promote leaf growth and improved colour. Specially formulated for Fine, Fine Miniature, Fine Dwarf and Economy Grass. 2 ounces in 12 gallons of water per 100M2. Fert 24 Hour "Fast Green"
Water on and see the difference in 24 hours. Does not produce extra growth and does not need extra mowing. Rate is 100 gms in 12 liters of water per 100M2. Idea for a good start to a new lawn. Add to topsoil to improve nutrient levels. Contains a mix of slow release and fast action fertiliser. Also known as ammonium sulphate. 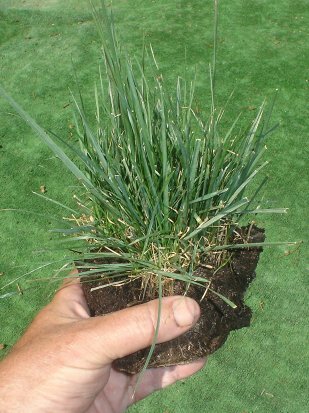 Our grass plugs are fully rooted sections of lawn and are ready to go. Supplied as a 1" x 1" plug. We also supply 2" x 2" plugs where appropriate. These are more mature plugs with larger root systems. We will supply the most mature plugs available at the time of the order. Our guidelines for plug spacings are 10 plugs (plants) per M2. 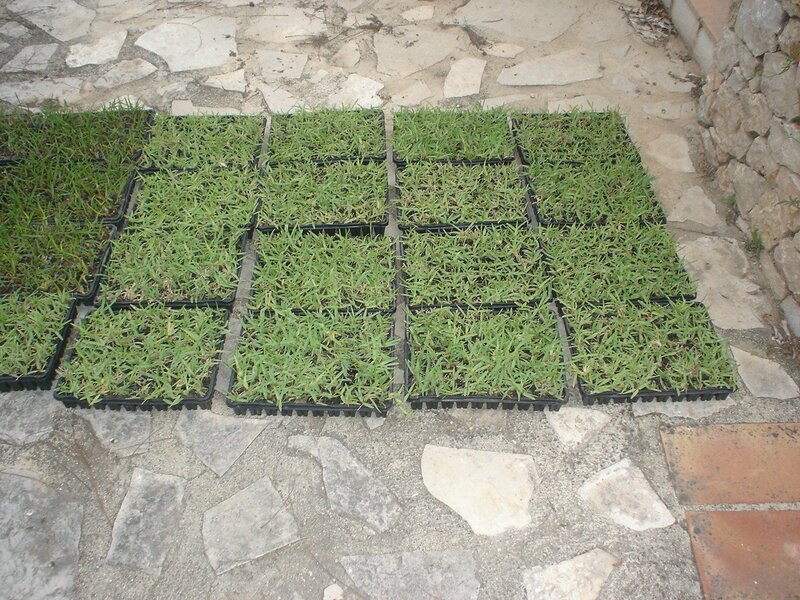 We supply the plugs growing as grass plants that may be short or 3 - 4 inches high, to provide as much plant as possible. 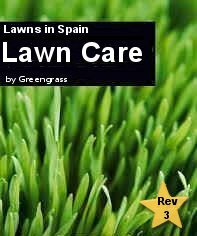 We always recommend using Lawns in Spain fertiliser before planting grass plugs. Best results mix with clover. Pre grown cartons of grass for people that want an instant green lawn like turf. Sow at rates of between 2 and 5 Kilos per 100M2. Ideal for shady areas and areas under trees. This seed produces a spectacular beautiful green grass lawn. Suitable for large domestic, urbanisation or public areas and golf fairways. Germination is 15 - 30 days depending on conditions. Must be kept wet until germination takes place. 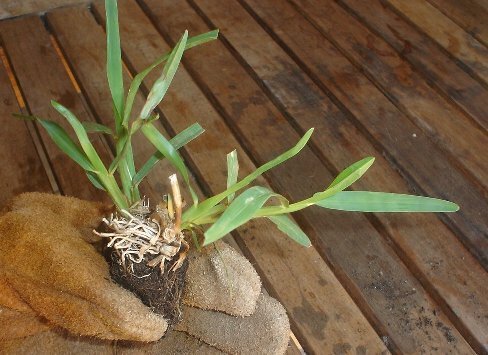 Needs plenty of water initially, but once established will survive long periods of drought. Fast growing. Sold in 1 Kilo jars or pre-sealed bags ready for transportation. Sow at 1 Kilo per 50-100M2. 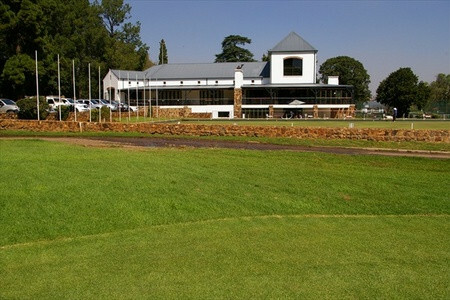 1 Kilo covers 300 - 400M2. Reduces the problems of ants, birds and watering in the initial stages of germination and also improves the germination rate. Forget the hourly problems of watering the seed several times a day. Just sprinkle on, water and keep damp for 3 - 4 days. Green shoots are noticeable in just 48 hours. Supplied next day delivery. When the seed is delivered, germination has already started, so soil must be kept damp for at least 3 -4 days after sowing. Try to sow late in day and water in. Next day water again before mid-day. From the time of the order, pre-treating does not make the grass grow quicker, but it does remove the clients requirement to water the seed until germination takes place. Delivered with green shoots and roots, rooted seedlings in compost to assist in establishing the seedlings. (Please add 3.99 P&P for hard copy, CD or DVD.) * Currently out of stock. New from America. Neptune Automatic/Manual Underground Irrigation System. Suitable for new or existing lawns. Save up to 60% of your water usage, compared to conventional sprinkler or drip feed systems. 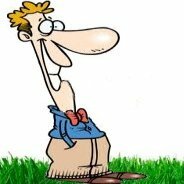 Requires site survey and exact shape and dimensions of lawn. Local deliveries only. Used for watering lawns FAST. For situations where time is critical. e.g Gardeners who need to deliver the most water in the least time. Owners with little time and need to water their lawn fast. Hose is perforated with outlet jets to deliver water super fast to your lawn, uses standard connectors, just clip into existing garden hose. Great for protecting seed from birds on newly seeded lawns. Ideal to revive sour soil that possibly has bee overwatered or waterlogged. Corrects the pH imbalance. Perfect for lawns on slopes or compacted lawns. Helps water percolate through very dry caked soil, or soil with thatch build up.